The crowd during the second round of the 2017 NFL draft at the Art Museum. NEW YORK — Despite a heavy move from Eagles ownership and the city of Philadelphia, Dallas won the right to host the 2018 NFL draft. Commissioner Roger Goodell made the announcement Wednesday alongside Charlotte Jones Anderson, a Cowboys executive vice president and the daughter of owner Jerry Jones. The three-day event will be held in the Cowboys stadium in Arlington, Texas. 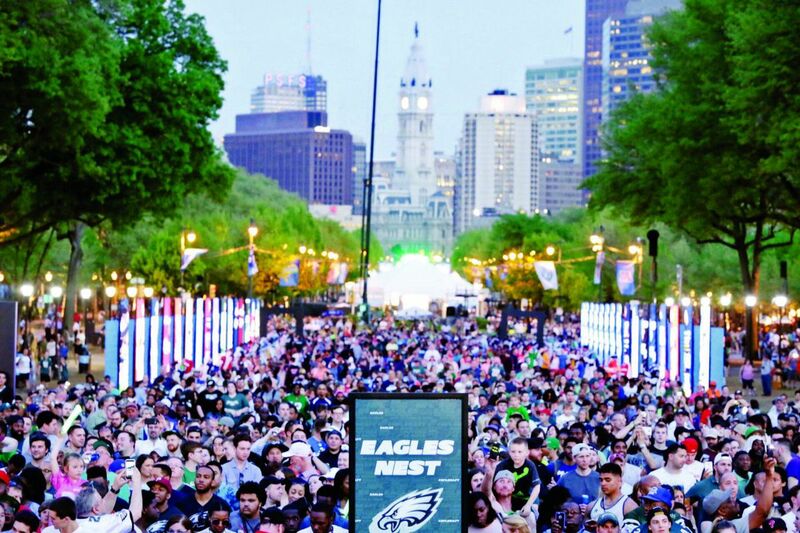 April's draft was held on the Ben Franklin Parkway and was an unprecedented success. Goodell acknowledged that Philadelphia, which hadn't hosted the draft since 1961, "set the bar high" for future drafts. Spokesman Joe Lockhart said the league's plan is to rotate the draft's venue each year because up to 20 teams expressed interest in hosting it. Lockhart said the economic value to the local community is estimated at nearly $100 million, about a quarter of what the Super Bowl brings but still ridiculously substantial. "There was a strong bid from Philadelphia to [host] a second year," because Chicago hosted consecutive years in 2015 and 2016, Lockhart said. New York was the draft's home from 1965-2014. "Philadelphia's strong push was based on Chicago's second year being better than the first year," Lockhart said. "But we were heavily influenced by the fact that so many of the clubs want to do it. Moving it one year at a time makes more sense for now."